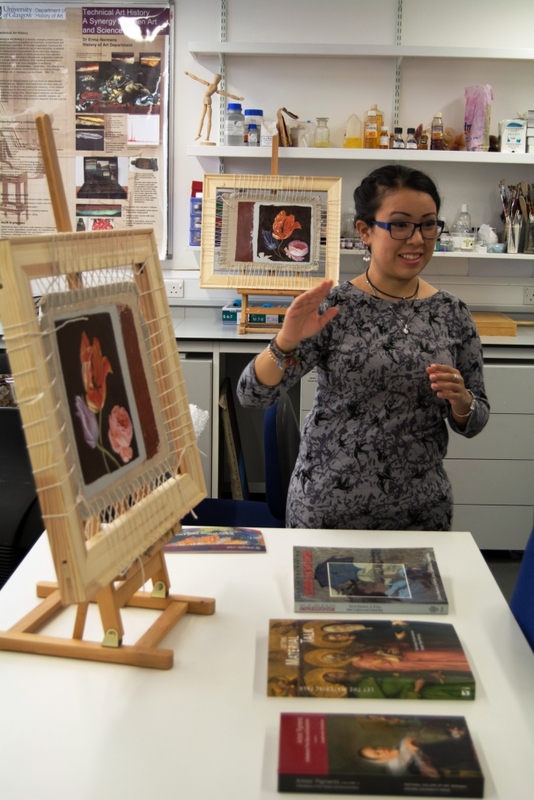 by Caitlyn Picard – First Year Student, MPhil Textile Conservation. Open Day. 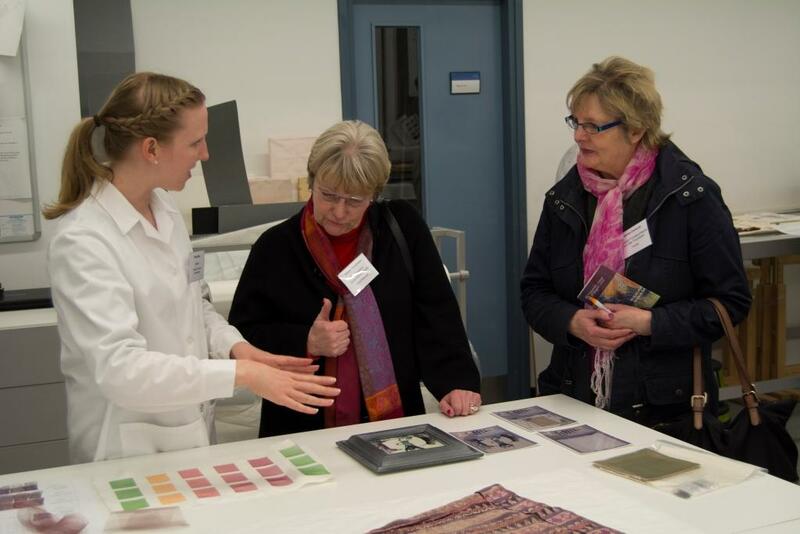 It’s one of the most important days of our academic schedules and this year took place on Wednesday March 18, 2015, with approximately 130 guests visiting the Center for Textile Conservation and Technical Art History (CTCTAH) facilities. 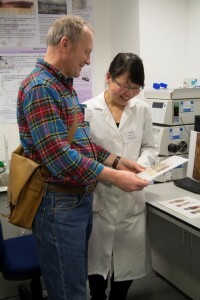 As an international student, I was unable to attend last year and was unsure what to expect on the day. 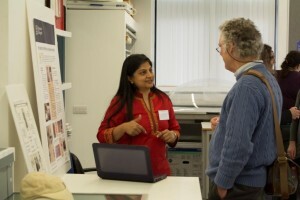 There was great excitement amongst all staff and students leading up to this event as this was a great opportunity for us to showcase what we have been working so hard on over the past academic year to professional colleagues, funders families, friends and interested parties alike. 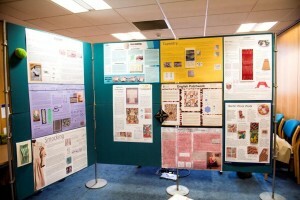 Visitors were first welcomed downstairs with posters describing different textile techniques designed by myself and fellow classmates as a part of our Understanding Textiles course before being invited upstairs to our level 3 workrooms along with the level 5 photography studio, and PhD analytical laboratories. A welcoming wall of enthusiasm greeted visitors to the first year workroom, all of us keen to share our experiences of the object treatments we have undertaken this semester. My colleague Freya and I were delighted to be able to discuss our treatment of samplers from Dumfries Museum, including my experience of washfastness testing of 20 different coloured threads! 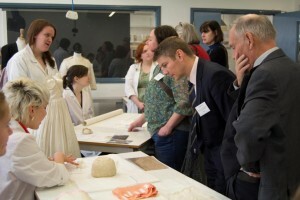 Also on display was a range of whitework objects which we have also treated, including a set of white linen damask napkins about which my fellow first year Michelle has already written. 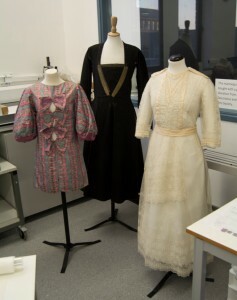 Standing in the corner of the first year workroom stood several costumes that were mounted in the past few weeks: a fabulous and eclectic mix including a Joyce Clissold tunic (on the left in the image belonging to Central St Martins Museum and Study Collection), a coat originating from Afghanistan (centre of the image, belonging to Dumfries Museum) and an early Edwardian dress, part of the CTC reference collection. 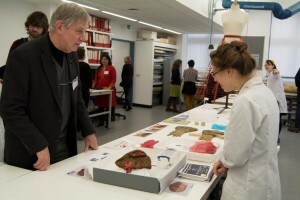 All visitors matched our excitement and were eager to hear about the objects and their treatment. Many guests were able to provide advice or ask fantastic questions both about the program, students and artefacts. 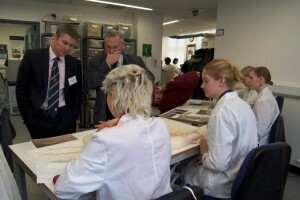 Guests were also invited to visit the adjacent workroom of the second years where students displayed very different artefacts: many visitors were delighted to get a chance to see the seal gut parka written about previously, although their keenness to understand the nature of the material by touching it gave the conservator a few heart stopping moments! 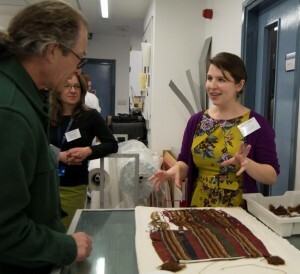 Having both rooms open to visitors really highlighted the skills and knowledge learned throughout the duration of the program and showcases the variety of objects textile conservators could have to opportunity to work on. It was fantastic to get a large turn out of people who are as interested and passionate about the work we do as we are and we are grateful to you all for coming. I hope next year is just as exciting.